Anyway, we got the teak looking all brown and golden again, rather than the dull grey it had turned over the summer, scrubbed the mould and grime from the decks and then we were able to put the canvas up. Putting up the bimini and sprayhood was challenging enough, and we spent an embarrassingly long time working out how the bloody straps were meant to go on and what order we had to do all the zips up (yes, there’s an order). John from Eupraxia had offered to help us with the main sail, correctly pointing out that 3 bodies would make the physical business of hauling the thing up onto the boom and then hoisting it much easier. 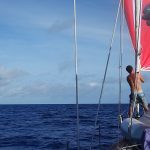 However, it was his experience and know-how that we really needed and after it became clear that our idea of how to put the sail up was a lot different to his, we let him take the lead and simply did what we were told. The whole thing took less than an hour and we were soon kicking back with tea and cake. Thanks John! The jib was an easier job and suddenly our boat was looking more like a sailing yacht and less like an abandoned shell! One thing we’d almost forgotten was just how much of our plans are dictated by the weather forecast. Another set of friends on Kwanza popped by one morning to say hi and bye; they were heading down to Falmouth before the storm set in. Nick and I were like, “Um, storm?” Turns out there was a low pressure system heading our way which was due to bring high winds from the north-west. 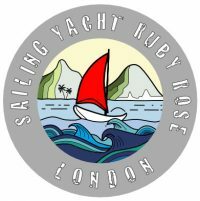 The prevailing winds in the Caribbean are always- well, almost always- from the north-east, east or south-east and the large swell was wrapping around the point and making Jolly Harbour anchorage very unpleasant indeed. We said goodbye to Kwanza and then hurried to check the forecast ourselves. It looked like we could either leave the next day, or be stuck for another week. There was only one problem. Our outboard wouldn’t start. It is, of course, possible to live at anchor without a functioning outboard. It just means you have to row everywhere. If we were, say, 100 metres from a dinghy dock and had lovely calm conditions then I would, if forced, row ashore. I was after all captain of my high school rowing team (a disclaimer: I was also a coxswain which basically meant I sat in the stern, steered, and yelled at the people with oars to work harder. I don’t think Nick would put up with me reprising that role). 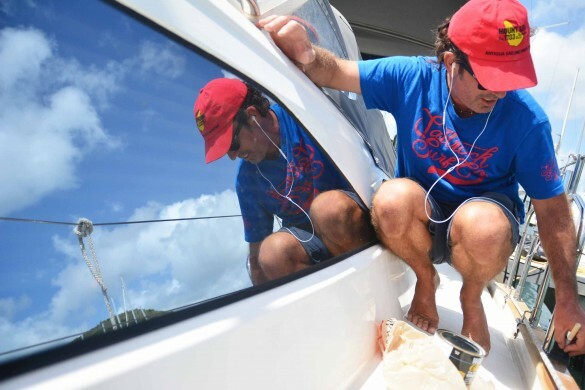 But, really, your dinghy is like your car and you really do need your outboard working in order to live at anchor comfortably. So we waited for it to be fixed. We’re finally back out on the water! Anyway, the outboard was fixed the next day which meant that we were able to take advantage of the brief lull in the windy weather to motor-sail down to Falmouth Harbour. It’s only a couple of hours away and along a stunning coastline so proved to be a beautiful start to our sailing season. The water was the most incredible turquoise colour and, despite a couple of brief downpours, the weather behaved. A little while later we were anchored in Falmouth Harbour. The following week was one of doing lots of boat chores and enjoying almost nightly sundowners with our friends on Eupraxia. Oh, and perving at superyachts. There’s plenty of opportunity for that in Falmouth Harbour. After several nights of high winds and sunny days- perfect battery-powering conditions- the weather calmed a bit at the so-called storm turned out to be a bit of a non-event for us in Antigua. 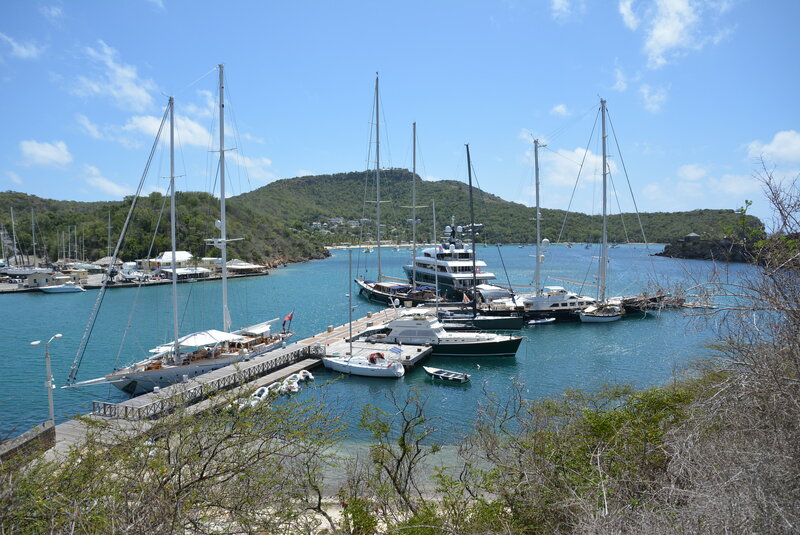 We decided it was time for a change of scene, and so motored the handful of miles around to English Harbour. 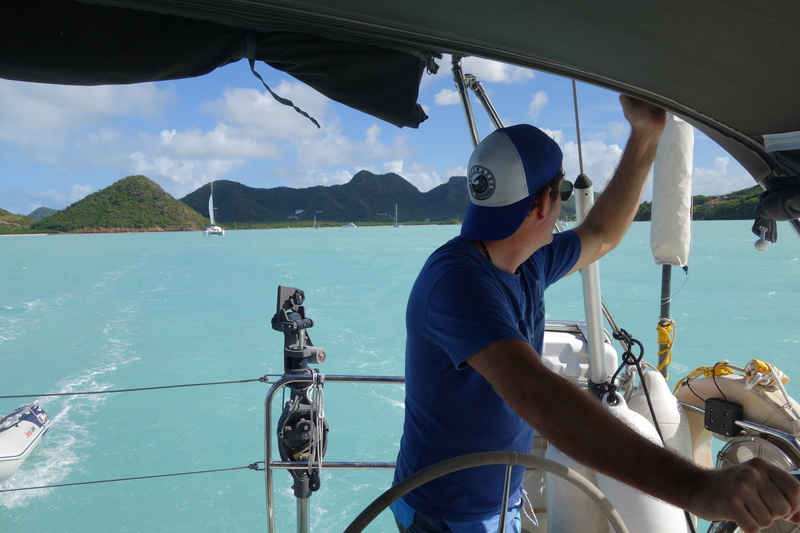 We anchored in the sweet little bay and were instantly impressed. It was very picturesque, the water was crystal clear- I even saw a ray (sting ray? Not sure) peacefully gliding along just beneath the surface one still morning; it was absolutely beautiful- and we were within short dinghy ride of Nelson’s Dockyard. Happy days! 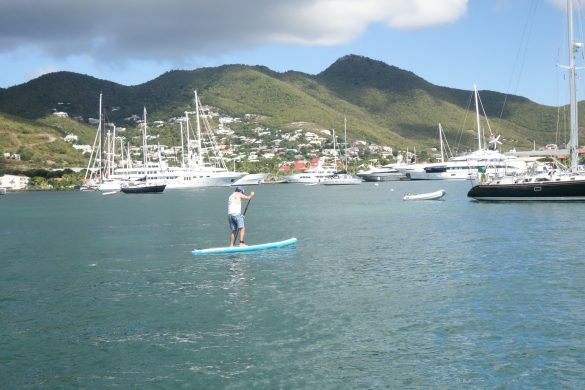 The stand-up paddleboard even made a short but enjoyable appearance one afternoon when we decided that playing in the water was far preferable to doing boring boat chores. Sadly, the thing blew up- yes, actually exploded- only the next day. Couldn’t tell you why, but it appears that the glue holding all the seams together failed for some reason. Nick has re-glued it all up and emailed Red Paddleboard Co for advice, but we’re yet to ascertain if it’s truly been fixed. I shall keep you updated. Anyway, do check out the video, posted above. If you like it, please subscribe to our YouTube channel!